Turn Your Child into a Great Reader! Are you concerned about your child's reading ability? Does your child hate to read? If so, you are not alone. In fact, 38 percent of American fourth graders are unable to read at a basic level. But now you can turn your nonreader child into a reading star—in just a few short weeks. Based on research done at Yale, this simple yet revolutionary guide merges the three essential elements of reading instruction: auditory training, phonics, and whole language. Inside, teachers and parents will find easy-to-read cartoons, games, and fun phonic sheets that will help almost any child read at or above grade level. 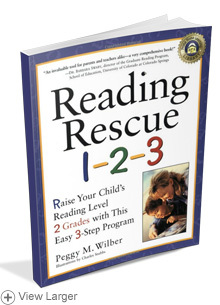 Reading expert Peggy Wilber will show you how to help your child develop better fluency, language skills, and comprehension. "This is an effective, user-friendly program for parents who want to get involved in their child's literacy education." —Doug Wittenberg, executive director, Whiz Kids Tutoring Inc.